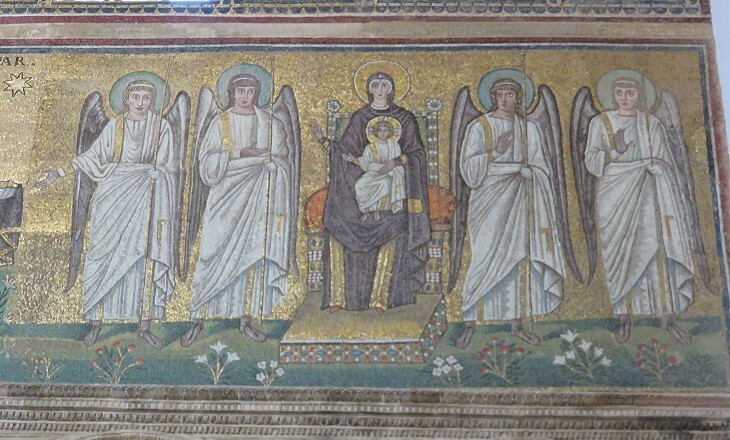 You may wish to read an introduction to this section or a page on Roman Ravenna first. 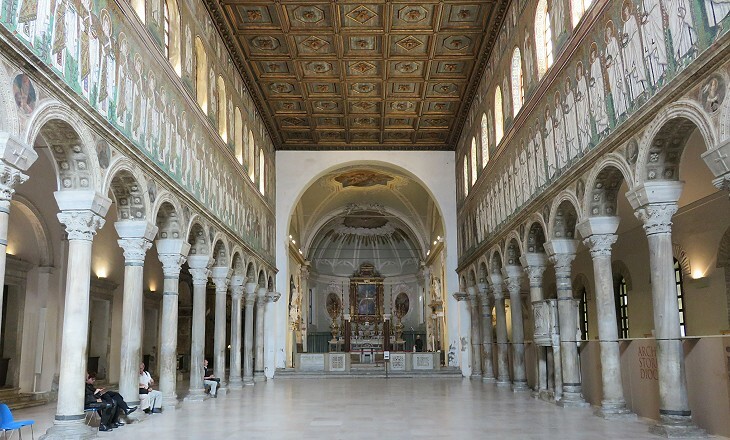 The basilica was built by King Theodoric in ca 500 for the Arian/Gothic community of Ravenna and it was dedicated to Christ Saviour. It acquired the current name in the IXth century when the relics of St. Apollinaris, a legendary disciple of St. Peter, were moved to it from S. Apollinare in Classe. In 490 Theodoric laid siege to Ravenna, where his rival Odoacer successfully managed to resist for three years until an agreement was brokered by the Bishop of Ravenna, by which the two would have jointly ruled Italy. Theodoric entered the town on March 5, 493 and just ten days later he personally killed Odoacer during a banquet. During the following night his men massacred Odoacer's relatives and supporters. Under the firm rule of Theodoric, Italy recovered her prosperity. Though illiterate himself, for he used a stencil to sign his name, he respected the arts and literature. He peremptorily forbade the spoliation and destruction of the monuments of ancient Rome (..) and he adorned his capital at Ravenna with new buildings, palaces, and churches. 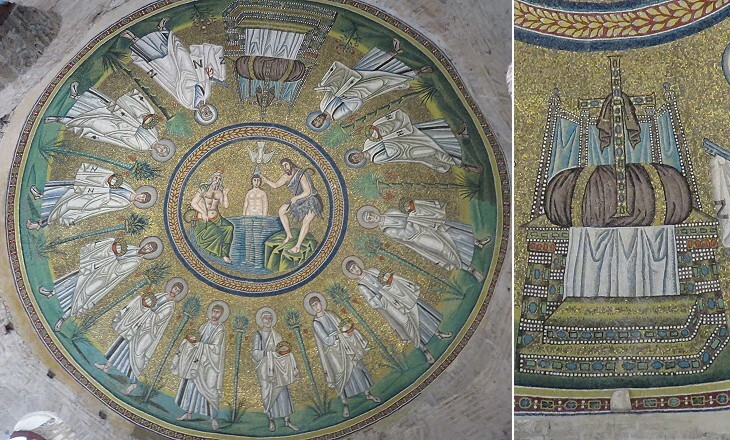 (..) The finest monument which Theodoric has left at Ravenna is the basilica of S. Apollinare Nuovo. The layout of the church is that typical of a Roman basilica, a building which had not a religious purpose, could contain a large number of people and had a rectangular shape with an apse at its end. Unlike the large churches built in Rome, S. Apollinare had three and not five naves (you may wish to see S. Giovanni in Laterano in Rome). 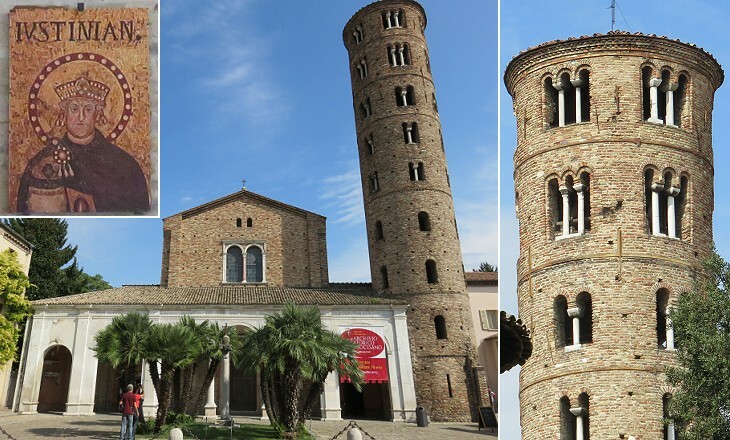 Another difference between the churches of Rome and those of Ravenna is that in the latter town, most columns and capitals were not taken from ancient monuments, but were expressly made. 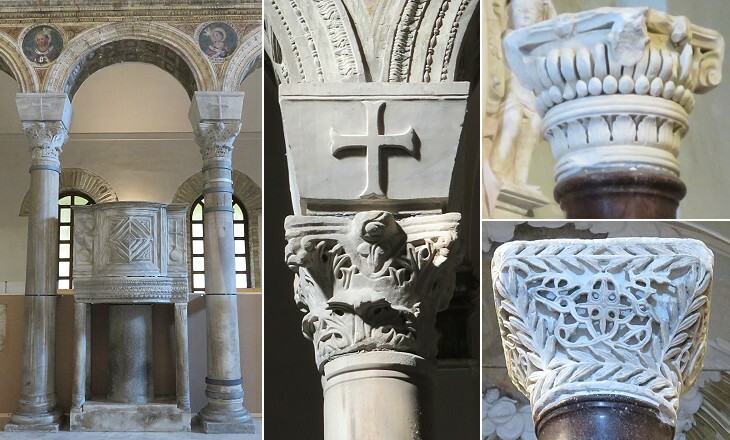 It is likely that the capitals bore the monogram of Theodoric, as did those reutilized to build a XVth century portico (it opens in another window). They departed from the traditional orders, although some of them could still be regarded as Corinthians. This page covers only the mosaics which are believed to have been made before Ravenna was conquered by the Byzantines in 540. Mosaics which were added subsequently are covered in a page with those at S. Apollinare in Classe. Consistent with the original dedication of the church to Christ Saviour, the decoration of the main nave included twenty-six small panels showing episodes of the Life of Jesus (on the left side) and of his Passion (on the right side). They were executed by different hands. Those depicting episodes from the Life were probably made first and Jesus was portrayed as a young shaven man, similar to the Good Shepherd at the Mausoleum of Galla Placidia. In the scenes of the Passion (which do not include the Crucifixion) Jesus was portrayed with a beard. Thirty-six large panels portray saints holding books or parchments. They are not accompanied by names or by the instruments of their martyrdom, but each saint is different from the others. Some are very young, others quite old and they do not hold their books or parchments in the same way. The decoration of the main nave side walls was completed by two large bands. The initial and final sections of the bands are attributed to the time of Theodoric, whereas the central sections are believed to have been added after 540 (or perhaps they replaced previous mosaics). 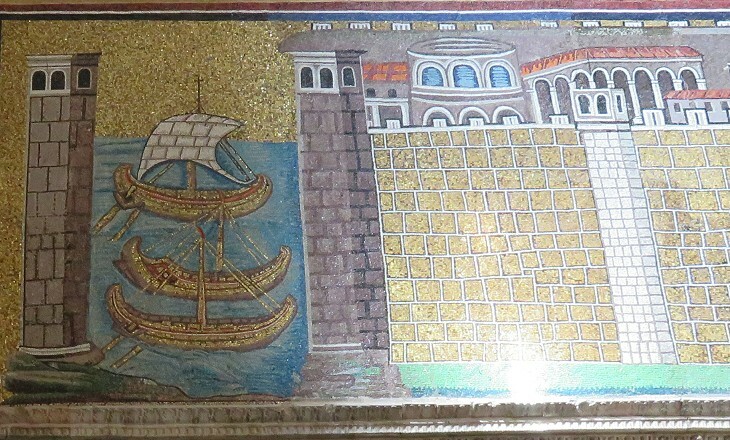 The two initial sections depicted Classis, the harbour of Ravenna, and the Palace of Theodoric (which is shown in the introductory page). 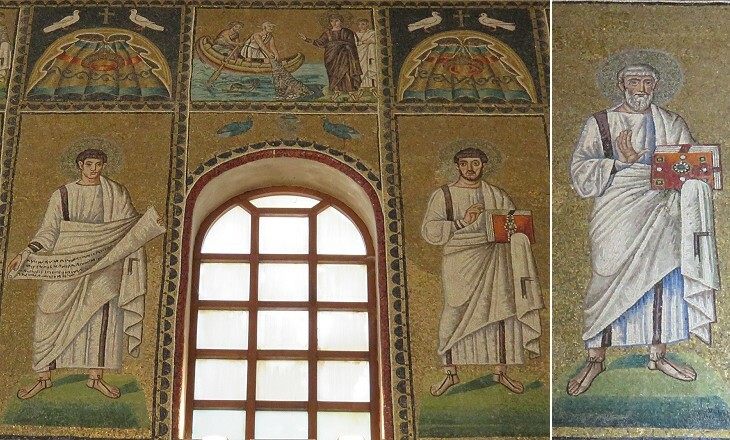 They included some figures (most likely Theodoric and members of his court) which were deleted so that these sections do not include human beings, thus recalling Byzantine mosaics at the Umayyad Mosque of Damascus. 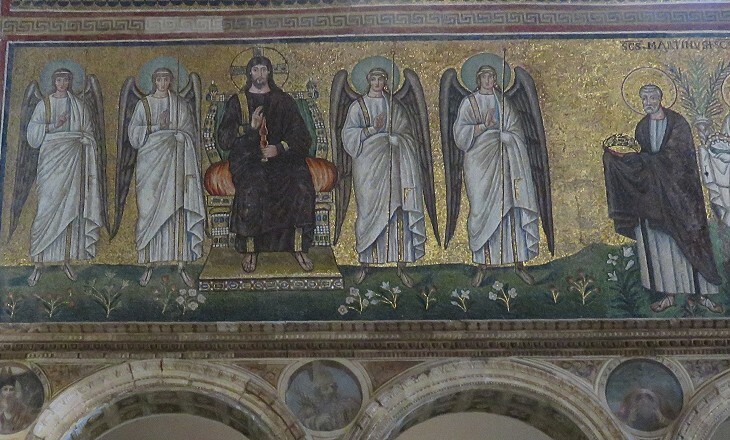 The final sections of the bands were very similar as they portrayed on one side the Virgin Mary and on the other Jesus Christ sitting on thrones and having four winged angels at their sides. The two groups stand over grass meadows with many flowers, a depiction of Paradise which is still linked to the Greek Elysian Fields, the afterlife location of the righteous. These two large panels are among the first ones where Jesus Christ and the Virgin Mary were portrayed in Majesty, i.e. seated frontally on a throne, clad in purple, as rulers of the world. Jesus held a book with the words Ego Sum Rex Gloriae (I am the King of Glory) which was replaced by a sceptre during a poor XIXth century restoration. What it is these long slim seraphs express I cannot quite say, but they have an odd, knowing, sidelong look out of the narrow ovals of their eyes which, though not without sweetness, would certainly make me murmur a defensive prayer or so were I to find myself alone in the church towards dusk. 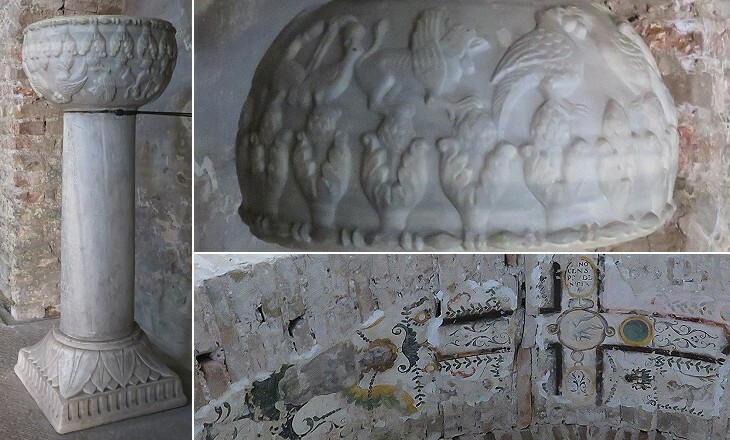 The apse of the church collapsed in the VIIth or VIIth century and the nature of its decoration is unrecorded. The number of Ostrogoths who followed Theodoric in Italy is estimated by historians between 100,000 and 300,000. Other Goths/Arians were already living in Italy, overall however they were a minority group and they did not mix with the Romans who professed the Nicene Creed. A Baptistery was built for them by Theodoric. It was very similar to an Neon's Baptistery, but slightly smaller. The building, as many others at Ravenna, is partially buried in the ground. Theodoric's political motto could have been two nations, one country, because Goths/Arians and Romans/Catholics were subject to different laws which took into consideration their cultural and religious identities. Theological differences existed between Arianism and Nicene Creed and most likely they influenced some aspects of the decoration of churches and baptisteries. 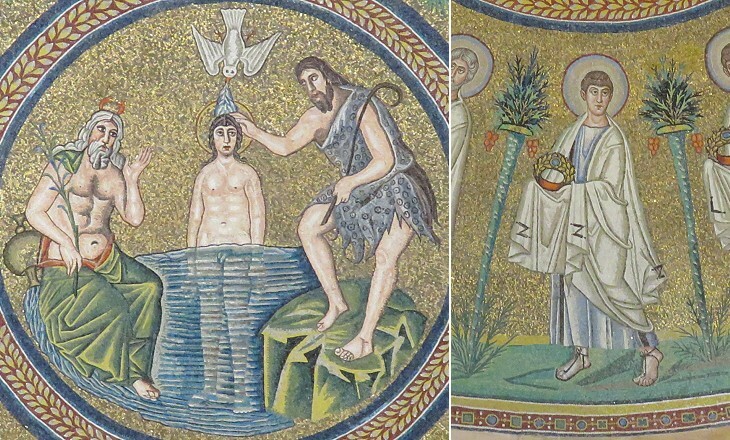 It is however evident that they were not paramount because the decoration of the ceiling of the Arian Baptistery is almost identical to that of Neon's Baptistery, including the personification of the River Jordan. 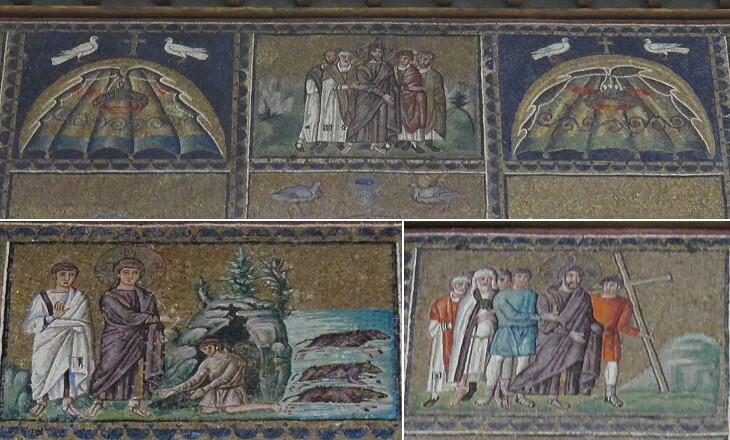 In this mosaic, as well as in that of the other Baptistery, the Twelve Apostles are the first Eleven Apostles plus St. Paul, the Apostle of the Gentiles. In the Vth century Emperor Constantine began to be regarded by the Greeks as a saint and even more than that, as he was given the title of isapostolos (equal-to-the-apostles). It is said that Theodoric hoped to be regarded as an isapostolos, at least by the Arians. So the inclusion of St. Paul among the Apostles was not without significance. It meant that the title of Apostle was not limited to the first disciples of Jesus. 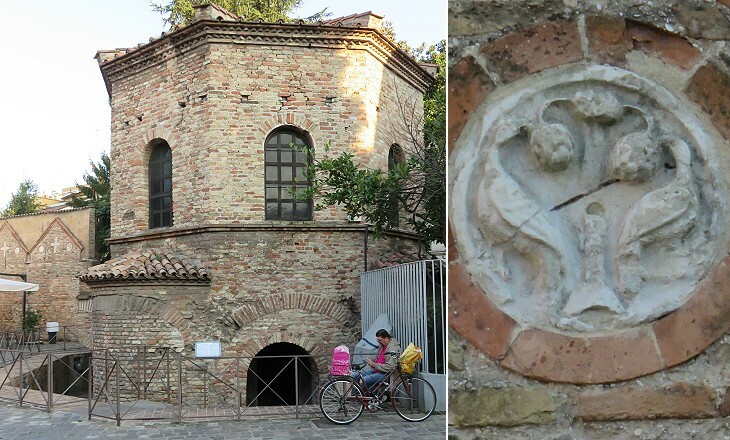 After 540 the Arian Baptistery was turned into S. Maria in Cosmedin, a small oratory (see the almost contemporary church by the same name in Rome) and the basin where baptism by immersion was administered was removed. The building retains fragments of its XVIIth or XVIIIth century frescoes. 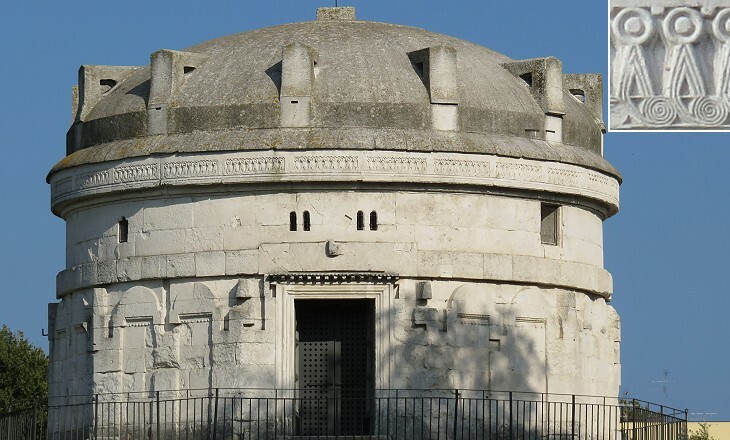 The mausoleum Theodoric built for himself outside the walls of Ravenna is for many aspects unique. It was made up of large white stones from Istria or Dalmatia, rather than of bricks. Its decagonal shape is very unusual. 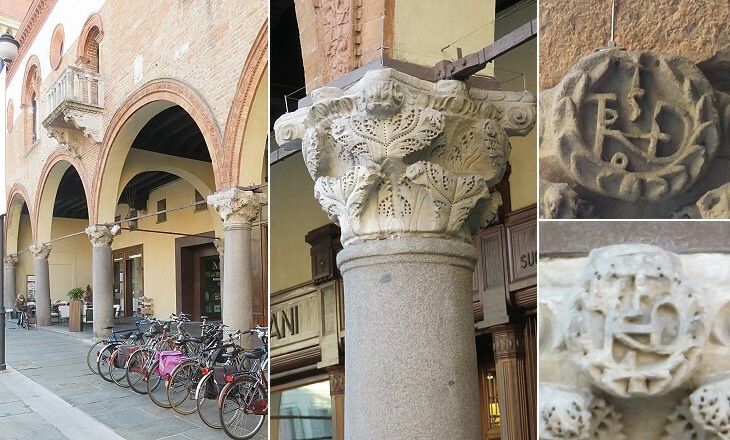 It probably had some small columns on the upper floor, but even considering them, columns and capitals did not play a major role in the design of the building (as they usually did in ancient monuments, including the Mausoleum of Diocletian at Spalato). Festoons, bucrania, Vitruvian scrolls, Greek key patterns and all the other traditional decorative motifs were ignored in favour of a pattern most likely derived from jewels the Ostrogoths used to wear. A gigantic circular stone completed the building. Its twelve pierced handles were most likely used to tie ropes to them and raise it, but their number might have had a link to the Apostles. 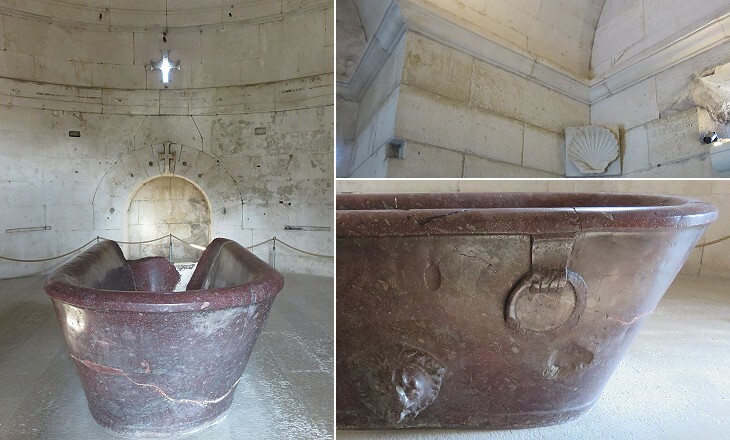 Maybe Giorgio Orsini visited the mausoleum and then decided to use a single block of white stone to cover the Baptistery inside the Cathedral of Sebenico (ca 1450). Many tales surround the life and death of Theodoric. He is the positive hero of Dietrich von Bern (Theodoric of Verona), a Germanic saga which is first recorded in the IXth century. In Italy, after the fall of the Ostrogothic kingdom, his memory was damned. According to a legend, a lightning bolt opened a cross-shaped break in the wall of the mausoleum and struck the king who was taking a bath. Then a dark horse appeared and carried the body of Theodoric to Sicily where it was plunged into the volcano of Lipari, one of the flaming mouths of the infernal world. 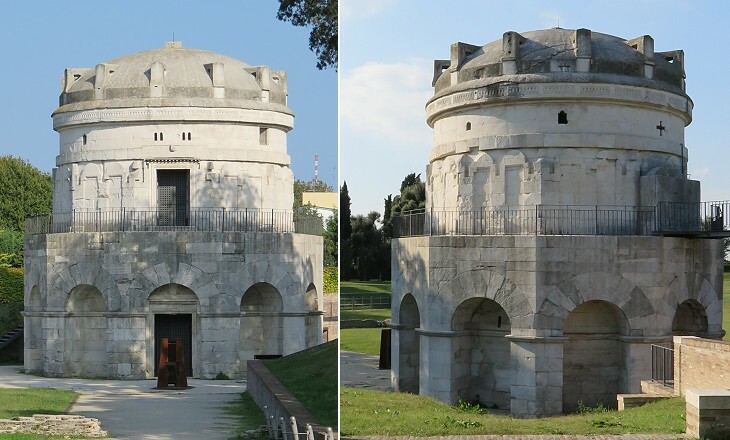 (*) At that time some sources indicated that the mausoleum had been built by Amalasuntha, the unfortunate daughter of Theodoric.